Welcome to the worlds greatest guide to Women's Bowling Shirts. 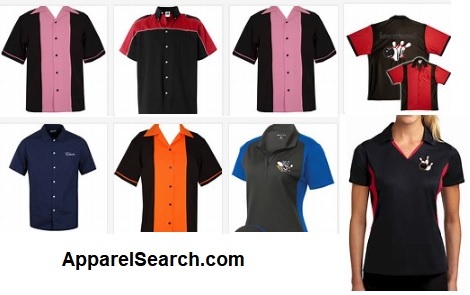 Are you actually looking for ladies bowling tops? Well, we hope you are because the reality is that you have found our women's bowling shirt page. Bowling is a sport or leisure activity in which a player rolls or throws a bowling ball towards a target. It is one of the major forms of throwing sports. Due to the fact that the sport requires throwing, a shirt that provides a good range of motion for the wearers arm is important. A bowling shirt is a style of camp shirt in which the fabric, color and design vary greatly, but frequently incorporate contrasting earth tones and simple geometric designs, with more expensive ones often made of silk. They may have a single pocket on the chest with small logos or monogram initials are also common. A camp shirt, variously known as a cabin shirt, cabana shirt, and lounge shirt, is a loose, straight-cut, woven, short-sleeved button-front shirt or blouse with a simple placket front opening and a "camp collar" - a one-piece collar (no collar band) that can be worn open and spread or closed at the neck with a button and loop. It usually has a straight hemmed bottom falling at hip level, not intended to be tucked into trousers. While generally made from plain, single color fabrics, variants include duo tone bowling shirts and print patterned aloha shirts. The Aloha shirt, commonly referred to as a Hawaiian shirt. Learn about other types of shirts from our fashion terminology section. If you are interested in learning about additional clothing categories for women, you can review the sections of our directory below.